DKNY has many delectable ways to Be Delicious, and now it has one that makes you positively shine. The DKNY Be Delicious Shine Collection is a limited edition of flirty scented items that light up your face and body. These succulently scented shiners tempt you to take an even bigger, juicier bite out of life. An effervescent interpretation of the DKNY Be Delicious Eau de Parfum. The energizing grapefruit that gives Be Delicious its characteristic sparkling note is highlighted to give Be Delicious Shine a fruity radiance. This illuminating effect delivers fresh, new, character to the signature American apple top note. The bottle is dressed this season to attract the light in shiny silver chrome with signature green gradation and logo label. DKNY Be Delicious Lip Shine Trio 2.4 g.
Three flirty lip glosses in three juicy shades - Fuji Red, Pink Lady, and Anjou Blush. Packaged in an apple-green stacked three-tiered swivel pot, you can carry this wardrobe of color wherever you go.The sheer formula invites layering with one another or as a glossy finish to your usual lipstick. The limited edition DKNY Be Delicious Shine Collection is the latest entry to the best-selling DKNY Be Delicious family of his and her fragrances, which includes its sibling duo, DKNY Red Delicious. 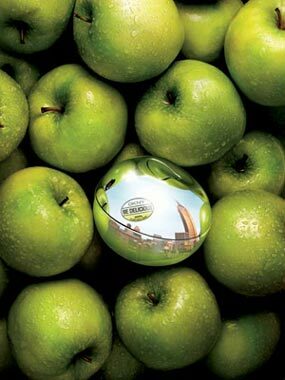 The DKNY Be Delicious Shine Collection embraces DKNY Be Delicious' original succulent floral, which has a crisp Green Apple note at its heart, developed exclusively for DKNY when the scent was first introduced in 2004. Founded in 1990, DKNY was created by Donna Karan to be the streetside of her luxe Collection. At DKNY, the clothes are friendly, the fashion fast, and the attitude sharp. Like all DKNY Be Delicious scents, The DKNY Be Delicious Shine Collection is like the city and brand that inspired it -- ripe for love, life and adventure. THE DKNY Be Delicious Shine Collection will be available at Myer, David Jones and The Perfume Connection (EDP only) from 23 September, 2007 for a limited time. Review: Delicious by name delicious by scent, a fresh spring/summer fragrance, that is easy to wear.